2/9/2018 I have been waiting since the spring for a sighting of this beautiful creature. 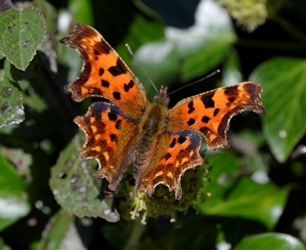 In early summer I caught a glimpse of that orange-brown glow fluttering past at a distance, but too briefly and too far away for me to get a proper look – though I was fairly certain it was a comma. No other butterfly shares its rich colour. But finally, a few days ago, one came onto the terrace, and sunbathed on the window long enough for me to get a photo on my phone. I think we all know that butterfly numbers have taken a nosedive in recent decades. When I was a child, our lavender bushes were almost invisible beneath the clouds of white butterflies enjoying the flowers. The buddlejas were always covered in tortoiseshells, peacocks, cabbage whites, brimstones, red admirals and the odd painted lady, comma or fritillary, if we were lucky. I am now sadly privileged to welcome only the occasional visitor to my garden. The small whites are the most numerous, but sometimes large whites, meadow browns, skippers, gatekeepers and common blues, amongst all the previously numerous buddleja frequenters, come too. Now, instead of the buddlejas, patches of head-high thistles around the garden – though proving somewhat problematic in their seemingly infinite spreading capacity – seem to provide the most attractive food source to my insect friends. I am torn between attempting to prevent them taking over entirely, and wanting to provide for as many creatures as possible in my little oasis.